This entertainer’s dream home in gated Boulder Crest offers majestic up close boulder formations & 360 degree views including Pinnacle Peak. 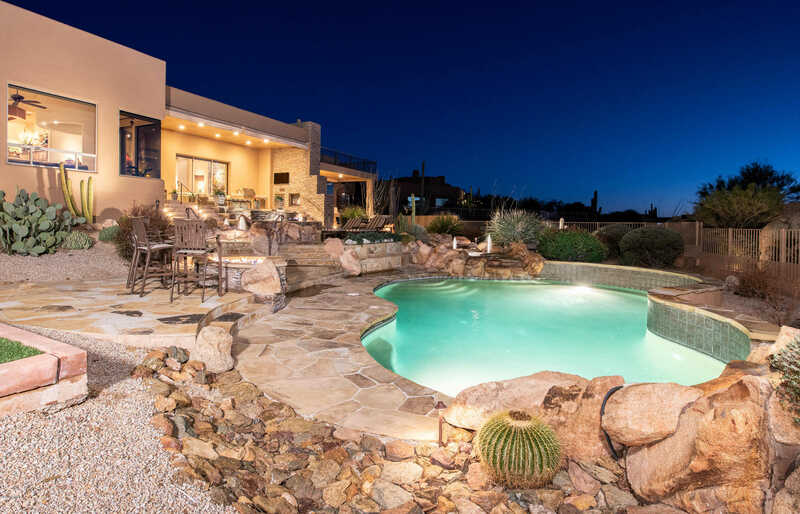 One-of-a-kind resort style yard features multiple water, fire & boulder designed accents w/sparkling heated pool framed by the boulder outcropping. Elevated travertine patio w/walk up spa w/negative edge waterfall, stacked stone accent wall w/TV niche & 2-way fireplace, built in BBQ, & rooftop view deck, overlooking the multiple lounge areas. The interior has 5 ensuite bedrooms, 1 is a separate entry casita. SW soft contemporary styling w/grand entry way showcases a boulder w/slate stone floor surround & rotunda style ceiling accent w/Art Deco chandelier. The living room has pocketing doors, stacked stone fireplace & full wet bar perfect for a crowd. I would like to schedule a private showing for this property: MLS# 5881139 – $1,900,000 – 29492 N 111th Way, Scottsdale, AZ 85262.